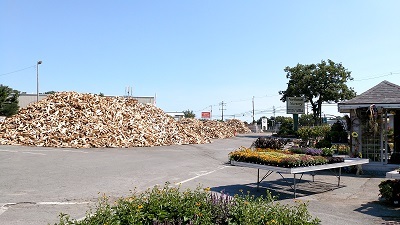 Northeast Nursery Garden Center has been supplying Massachusetts residents with premier, locally sourced firewood for over 34 years. Primarily from the states of Maine and Vermont, our mixture of hard woods (made up of Oak, Birch, Beech and Maple) is handled with care all the way from receipt on our property at 234 Newbury st in Peabody, Ma to deliver at your home or business. Available for either pickup or delivery, firewood is pre-sorted into individual buckets and then hand "shifted" to ensure no air pockets exist (you get your money's worth!). We store our kiln dried and seasoned wood under tarps at night and during rainy weather to make sure you have the minimum amount of moisture in your wood pile this winter. In addition to our kiln dried, green and seasoned firewood, we sell mulch, loam, sod, crushed stone, nursery plants and more. Landscape professionals and homeowners alike have trusted Northeast Nursery with their home and garden projects for many years, and we hope to earn your business next! Join in and write your own page! It's easy to do. How? Simply click here to return to Firewood Business Directory.